This week we’ve got a great deal just in time for Christmas, we’re offering 100% cashback up to £10 on Lego purchases! This great offer includes everything on the Lego site from bricks to Lego Duplo, making it the perfect stocking filler for all ages! All new members need to do to claim this deal is follow the steps below! All new members have to do to claim their FREE Lego is follow these four easy steps! 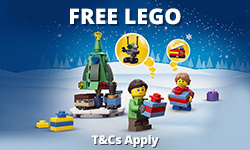 Click 'Get Cashback' to go through to Lego website and make your purchase. New members can grab a perfect Christmas Stocking Filler knowing they'll be recieveing 100% cashback up to £10.